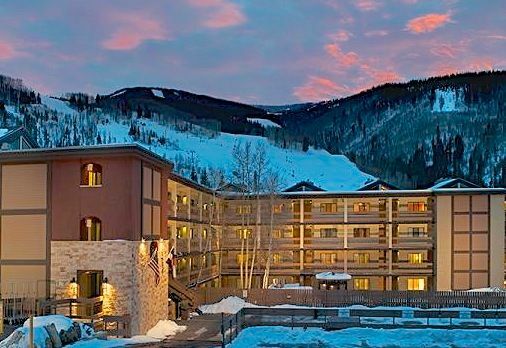 Our condo is located just East of the heart of Vail Village, a short walk from the Golden Peak lifts. A private shuttle is provided by our complex to both Golden Peak and Lionshead lifts for scheduled drop-off and pick-up during peak hours. Take the Vail bike path located just out your door, and walk to the many world-class restaurants, shopping and Vail's renowned night-life. Our European 2 bedroom, 2 bath condo includes a queen size bed for guests, as well as a master bedroom with queen size bed and a loveseat which opens into a single bed. Experience the fabulous, sunny view of skiers descending Vail mountain out your third floor living room window or walkout balcony. The living room features a no-hassle gas fireplace, log beams in the ceiling, media center with HDTV with DVR and DVD players. Enjoy the benefits of a fully furnished kitchen with dining area and new polished tile floors. After a day on the slopes, relax in one of 2 outdoor hot tubs and take a dip in the outdoor heated pool. Enjoy the on-site game room with pool table, fitness equipment, TV area and handy snack machines, as well as the convenience of your reserved underground parking space. The elevator makes the trip to your 3rd floor condo painless. There is a laundry facility on the property as well. Everything you need for a memorable mountain vacation! Gas Fireplace, Phone, 2 HDTVs on cable (with DVR), 2 DVD players, Stereo, fully furnished kitchen with dishwasher and microwave, outdoor patio, two queen beds, fold open love seat, pool, 2 hot tubs, Game room, garage with covered parking, and a spectacular view. Free private shuttle available for our condo guests. Delivers and picks up from skiing and shopping. My wife live in Denver and use our property whenever we can. We have owned property in the Vail Valley since 1986, and finally in 2002 we upgraded and purchased a place closer to the center of all the action so we could walk to the lift and all the resturants. It makes such a difference not having to drive or wait for a bus. Our unit is on the 3rd floor of a 4 story building (view of the ski slope- golden peak lift area). The building entrance is on the second floor. Great Vail vacation at the wren again. Stayed in 308. Owner was a pleasure to work with. Location is an easy walk to the village or golden peak. Condo had all the things you need to get by on. Very comfortable place. Would definitely stay there again. We had another great stay here, we really enjoyed it! We came back a second time because we liked it so much and we were so glad we did. It’s a lovely place and it feels like home. Very well maintained with great amenities and attention to detail. This condo is just a short walk to Mid Vail and the base of the ski lifts. there is a free shuttle from the resort which can take you even closer or bring you home. Great view of the mountains. the kitchen is well stocked with spices and supplies. A great unit for 2-4 people. Host was very responsive. We really enjoyed our stay there!!! It was clean, comfortable and well maintained. It has a very pleasant ambience and we loved the fireplace. The view was fabulous and it was an easy walk to the Golden Peak lift and base area for us and our young children (without equipment). The shuttle from the Wren to and from the different base areas was very convenient. The only downside was that it stopped running pretty early in the late afternoon/early evening so if we stayed in the village after we skied we had to find other transportation back (walking, Uber, taxi). Also if you need to do serious grocery shopping it’s easier to take a taxi than the shuttle because it’s 45 minute time limit included the several minute drive and there’s very little time to shop and pay. If you just need a few basics, it’s a really nice amenity. The amenities in the condo were top quality, we didn’t feel like we were in a hotel. It felt like a home with good big bottles of shampoo and conditioner instead of tiny hotel bottles and real toilet paper instead of thin hotel paper. There was wi-fi included.The owner was a pleasure to deal with and he was super accommodating. If we return to Vail in a small group, we’d definitely stay there again. A lovely, well maintained property. Right on the Gore Creek and very walkable to the Village. Very well decorated with many updated features. Throughly enjoyed our stay. Our place Is located in the Vail village and is walking distance to the Golden Peak chair lift as well as all the restaurants, shopping, etc. The balcony is just above Gore Creek, and as you can see in the photos it has a great view of the mountain, has a pool, hot tubs, game room, underground parking, etc. The biggest advantage is the location... walking distance to the chair lift as well as almost everything in Vail village. Our complex also offers a private shuttle with scheduled drop-off and pick up at both Golden Peak and Lionshead area. Cancellation policy - all money paid is non-refundable. Unlike a hotel where they have multiple rooms, once my unit is rented I block out the time, and later inquiries are told my place is booked. If the booking is cancelled with enough time to re-rent the slot, the owner will refund everything over the original obligation. Please contact owner for additional information.